Importance of Headspace! - Canning Homemade! Home » »Unlabelled » Importance of Headspace! Headspace. The unfilled space in a canning jar between the top of the food or liquid and the underside of the lid. 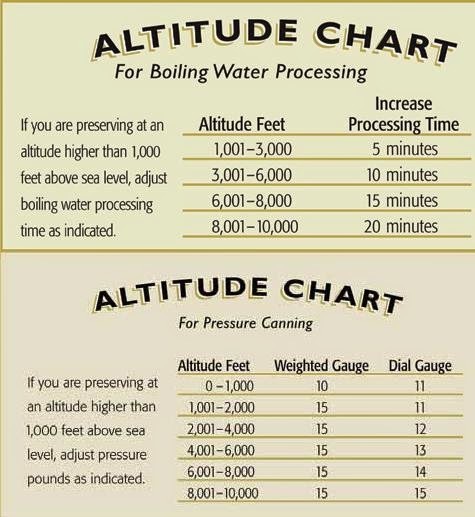 The correct amount of headspace is essential to allow for food expansion as the jars are heated and for the formation of a strong vacuum seal as jars cool. 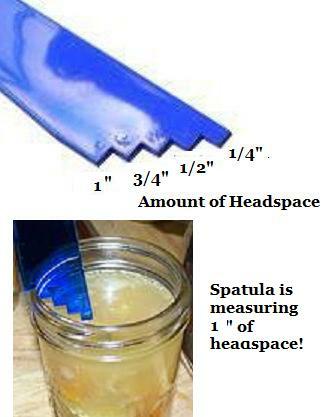 I want to make sure that you have a visual example of the best way to measure how much headspace is in your jars. To the right is a canning Bubble Popper & Measurer which you can buy by itself (Available at SB Canning Store) or as a set which includes the other three canning tools. The bubble tool looks like a staircase and I will reference the last stair where the (1/4") is shown in the picture as the "last stair". In the description of "headspace" above you can use this tool by resting the stair on the glass rim of the jar for the measurement required by your recipe and then making sure that your food or liquid just touches the bottom of the last "stair". As you can see in the picture the spatula is resting on the rim of the jar and is measuring to the bottom of the last "stair" closest to the food. From this picture you will have 1" headspace. Remember to remove any air bubbles before you do your final measuring as the level of the food will go down after removing those pockets. I would rather many of you learn how to do this with some kind of measuring device before you start eyeballing which at times may be the reason that your jars do not seal. Too much headspace can make it difficult to drive out all the air during processing and as a result you don't get a ping! Not enough headspace can lead to food pushing up on the lid during processing and getting trapped between the glass and the rubber not allowing it to seal. Either way your efforts seem frustrating. Many of you have seen this problem with the Apple Pie filling and dried Beans. The expansion of the food needs to be taken into consideration and that is why the headspace should be fairly accurate. In some circumstances you may have a perfect headspace before the jars hit the water bath or pressure canner, but the headspace after processing is low or seeping out the top. If the jars seal after processing you can put them in your pantry without the rings for one year to enjoy.